My husband, Andrew & I generally agree on television shows. We both enjoy Law & Order on Netflix, ChicagoPD & watching The Simpsons on a daily basis, & he tolerates my love of Two Broke Girls, while I join him on the couch while he gets in every minute of the Spurs playoff games that he can. But when it comes to cooking shows, I'm on my own. My husband is no slouch in the kitchen, but for whatever reason, he doesn't like watching someone cook on TV. So, catching up on the latest episodes of my favorite Food Network & Cooking Channel shows is what I enjoy doing most when I have 'alone time.' And that is a-ok with me. I learn a few things, get ideas for flavor combinations & renew my excitement for trying new recipes. Even if you love to cook, you still need a little motivation now & then to keep getting dinner on the table night after night. 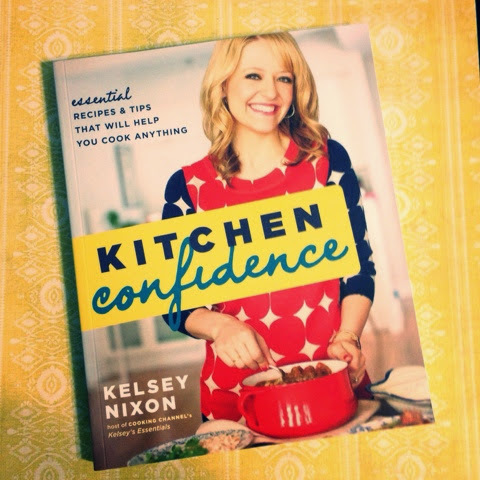 Near the top of my list of TV chefs is Cooking Channel's Kelsey Nixon. I've been a fan of hers for a while now & watching Kitchen Essentials on the Cooking Channel is one of my favorite ways to wind down in the evening. I think my DVR is storing at least 25 episodes of her show right now, if that's any indication of my fandom. Her friendly demeanor & laid-back style is something I strive for in my own food writing. Even if she's making a dish I've never made, or even tasted, her approach makes me feel like I could pull it off without a kitchen panic attack. I also love how adaptable her recipes are. Using her technique, you can often swap a few main ingredients to create a completely different dish; and Nixon encourages you to do just that, often offering up variations. So, when I saw that she was coming out with a cookbook, Kitchen Confidence, I was really excited. I picked myself up a copy a few weeks ago. I've been thumbing through the pages & flagging things I want to try, but, just like I did with the latest edition of Trailer Food Diaries Austin Cookbook, I wanted to take reading Kelsey Nixon's cookbook a step further. I'm bound & determined not to let this be a cookbook that's only browsed through. We've all been there; admired all the delicious photos, excited to try all the recipes of a new book, only to put it on the shelf & never make a dish. Well, not this time! May is going to be fun & I can't wait to share all of the tasty details with you!